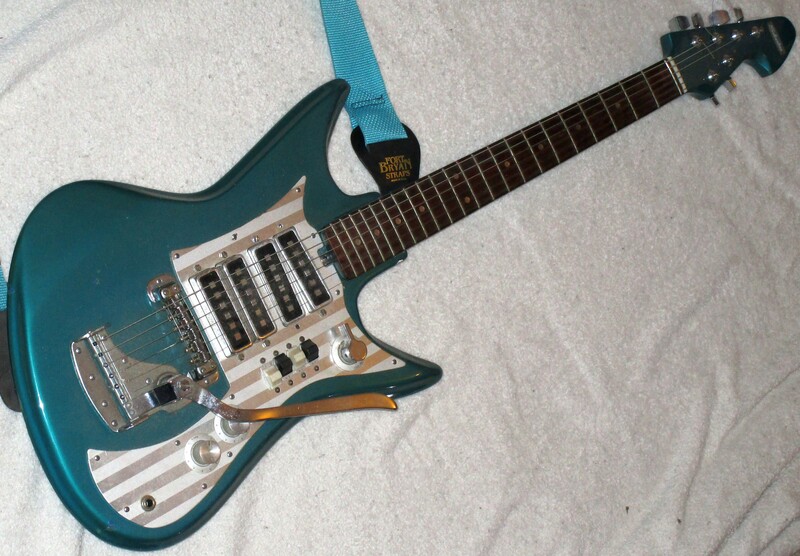 This Teisco is branded Silvertone, which was the Sears house brand. 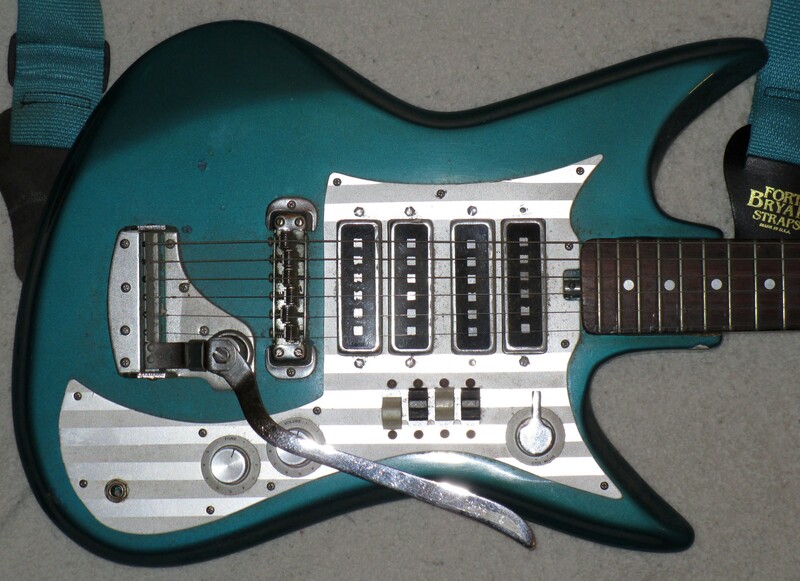 I bought this can opener beauty in the early ’90s from Guitars on George, back when it was called We Buy Guitars. Yes, the guy who sold Live all those goofy clothes they wore on SNL back in the day. But don’t hold that against him! I paid roughly $80 for it. It was in marginally better condition, then. 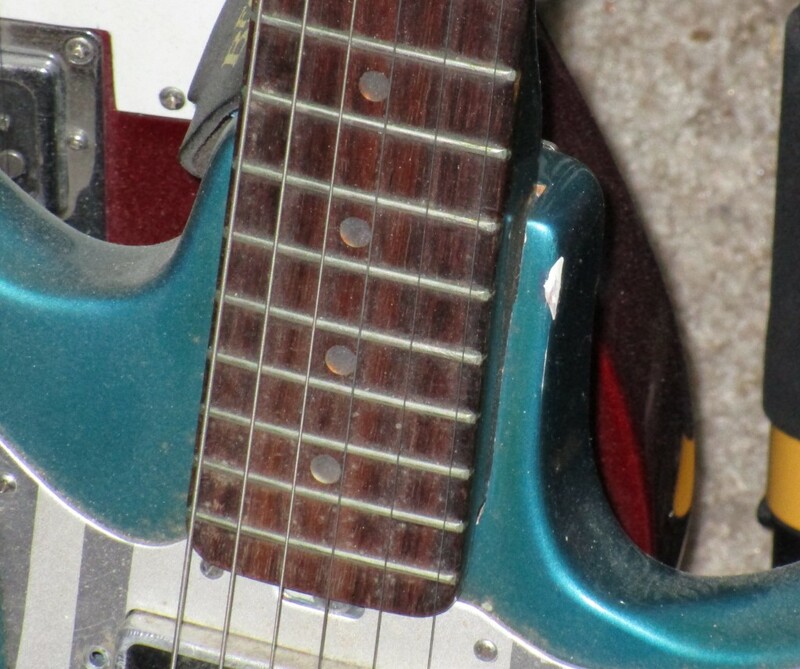 The guitar was originally blue, but it has aged to a wonderful teal. Probably some combination of lacquer yellowing and bar smoke. It has dot fret markers, rather than the square edge markers seen on some others. Somebody offered me $600 for this guitar once, and I turned him down. We were both idiots! The thin, quirky tones are about what you’d expect if you’ve ever played an old Japanese guitar. There’s a certain rawness about it that you just can’t get from some boring guitar like a Strat. Then again, anyone who would willingly choose this as their main axe over a decent Strat or Les Paul copy is delusional. I love this guitar’s triumph of style over substance, but I don’t think I’ll be selling the Strat anytime soon. This Teisco has all the signs of “ex-lover” neglect. I played the hell out of this thing for years, then got bored with it and set it aside as a dust collection device. Don’t scroll if you hate grunge! Two of the odd hex-shaped slotted pickup screws are missing, there is major dirt and grime everywhere, the switches have gone from barely-functional to non-functional, the chrome is flaking off the whammy bar, ugh. I love it too much to part with, but not enough to ever play it, so it never gets cleaned. I smell a restoration project! The guitar has a “zero fret”. 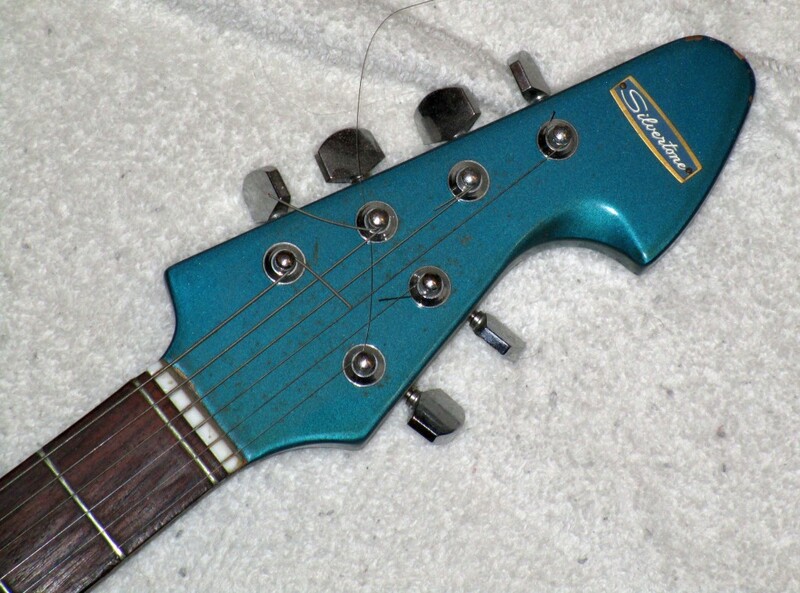 A lot of older cheap guitars came with zero frets because it relieves the manufacturer of the responsibility of learning how to properly manufacture a nut. However, the zero fret is not evil. Generally, the action is a bit lower with a zero-fret guitar, and open strings sound pretty much like fretted strings, giving the guitar a more “balanced” string to string response when playing open chords. A few high-end guitars come with zero frets for those reasons. The tuners are not original. In fact, this is just a 3 on 3 set that somebody “repurposed” as a 4 on 2 set! I used to see these tuners all the time for around $10 a set. Worthless. It’s a wonder this guitar stays in tune at all. There is a big chip beside the neck. You can also see how poor the neck joint is on this guitar. The neck will shift if you press on it, no matter how tight the screws are. I have no-name Chinese guitars that are better made than this. Here’s a good shot of all the knobs and switches. 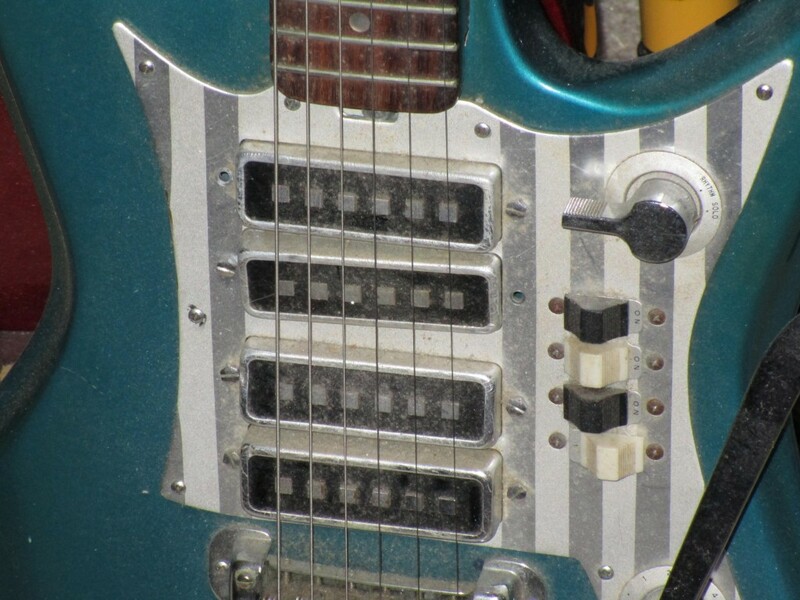 The 4 switches under the pickups aren’t phase switches, they are just on/off switches. The big chrome switch on the bottom right is a bright switch. It has one volume and one tone. The tone is wired backwards. It has a roller bridge, but it still doesn’t stay in tune. See above about the tuners. Playing this guitar is odd. The balance is way off. You have to use your left hand to hold up the neck to keep it from hitting the floor. I find myself hitting the pickup switches during songs, and the knobs are obscured by the whammy bar. Not exactly ergonomically designed, and that’s most of the charm! Restoring this guitar has been on my ‘to-do’ list for about 10 years. I doubt I’ll get to it anytime soon. Posted in Japanese. Tagged japanese, quirky, silvertone, teisco.